Welcome to Hill Country Pools & Spas, your one-stop destination for all things pool and spa related. As a pool and spa owner, we want you to be able to enjoy the water with your family and friends, and that’s why we remain dedicated to make pool and spa ownership as worry-free as possible. Since 1972, Hill Country Pools & Spas has been providing Kerrville, Fredericksburg, Boerne and the surrounding Hill Country areas with superior customer service, quality pool and spa products, equipment repair and high-end portable hot tubs that will keep your outdoor oasis operating efficiently and looking beautiful. When you choose Hill Country Pools & Spas as your retailer, you’re choosing a company dedicated to providing one-on-one customer service. Whether you’re in need of chemicals or are in need of equipment repair, the Hill Country Pools & Spas experts will work closely with you to ensure all of your questions are answered and needs are met when it comes to your pool or spa. We offer free computerized water testing, providing you with a detailed water analysis to ensure your water chemistry is well balanced. And our knowledgeable service technicians are on hand for many different equipment repairs. Looking to Incorporate a Hot Tub? 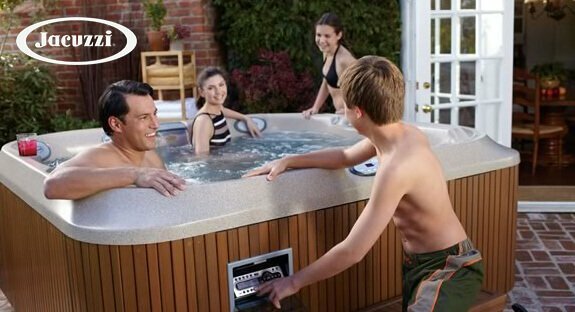 There are many benefits to owning a hot tub, including stress relief, joint comfort, sleep enhancement and quality family time. Come visit our showroom to see today’s top models from Jacuzzi and Hot Springs Spas, and let us help you choose the best one for your backyard. With many additional features and accessories to choose from, you’ll find just the right hot tub to enjoy for years to come. Stop by our Kerrville store to speak with one of our pool and spa experts. The Hill Country Pools & Spas team is ready to help you choose the best products for your pool and spa today. With so many different styles, shapes, features and materials to choose from, there is no reason your pool and spa should not be as uniquely individual as you are. Lonza is world's largest supplier of swimming pool and spa sanitizers and related treatment products, including the world-famous HTH® brand of chlorine-based sanitizers. Get your project started right by browsing through the different spas we offer. Take note of materials, overall looks, anything that will inspire you for your upcoming project from Hill Country Pools & Spas.